Based on the "triangle-knob" circa 1971 4-transistor fuzz, but I've changed the input capacitor to a more saturated-sounding type like the circa 1973 'rams head' version fuzz. From there, I've tightened up the bass and smoothed out the highs and eliminated the mid scoop. So instead of a raging wall of fuzz, you get a more focused and amp-like tone, without having to stack with eq's and/or other overdrive pedals to smooth things out or bring up the midrange. The thick, soaring tone sounds great on all pickup positions and cuts through the densest mix. The tone control is tuned to get useable sounds at all positions, with the middle setting having a flat eq curve. The "Flat/Juicy" switch lets you add in extra midrange thickness, giving you more options to tweak your sound. For example, you can get a cutting, yet thick tone at full clockwise with the switch in the "Juicy" position, and no ice-pick treble will assail your ears. When playing in a group setting though, or with a backing track, the Flesh does have the advantage simply because it doesn't have those scooped mids... It doesn't get lost, or just have the highs eeking through. You get a nice, full range fuzz sound with plenty of clarity and, for lack of a better term, 'harmonic content'. It's the non-traditional tweaks that allow it to do this I realize, so while it doesn't absolutely nail the iconic standard tone, the changes allow it to be heard while still retaining many of the qualities that an old-school Muff brings to the party. This is not a 'hybrid' OD/Fuzz by any means - when you step on it, you know you're stepping on a fuzz from the Muff family tree, and it has the bloom and sustain that some Muffs simply don't without making it too 'OD-ish' (which was the case for me with the Top Fuel). The 'juicy' mode was a very pleasant surprise as well - it's not a pronounced mid-hump, but it just adds that special something... hard to describe, but I likes it! In the end, I'm keeping the Pink Flesh on the board... 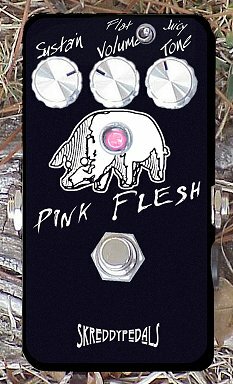 The Pink Flesh's qualities lend themselves toward versatility while still retaining many of the best aural treats of a vintage Muff. Thanks again Marc... and sorry it took a while for me to give you some feedback!" Turned up today... beautiful pedal, very lyrical, thanks!"